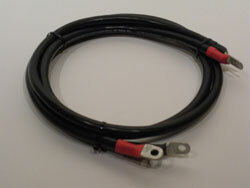 Our inverter cable sets provide a PROFESSIONAL, FAST & SAFE connection from your inverter to the battery bank. Made of incredibly flexible, marine tinned copper wire, and sold in color-coded pairs. Remember... Since this cable DOES NOT S-T-R-E-T-C-H, be sure to choose the proper length & size cable set to complete your inverter installation.